Tuesday, December 11th from 3 p.m. - 9 p.m.
Tuesday, February 12th from 3 p.m. - 9 p.m.
Tuesday, April 9th from 3 p.m. - 9 p.m.
Tuesday, June 11th from 3 p.m. - 9 p.m. 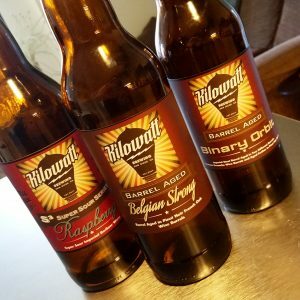 Receive three (3) 22 ounce bottles of unique Kilowatt beer selected by our owners every other month. Free Kilowatt growler (glassware only) upon sign-up. Special member’s only events and discounts. 15% discount on Kilowatt beer and gear. Look forward to members’ barrel tastings, beer futures tasting and pre-sale events, pre-release beer events, and more!! You must be at least 21 years of age to become a bottle club member. Initial membership is for a minimum of 6 month period. Bottle pick up is available on the 2nd Tuesday of every other month. In order to ensure bottles are available by the date of the pick-up event, you must be signed up as a bottle club member at least 3 days prior to the pick-up event. Otherwise, you will receive an e-mail when your bottles are ready for pickup. Each Bottle Club Member special release selection is guaranteed until the last day of the month. After last day of the month, members can select three (3) 22 ounce bottles of equal or lesser value from available bottle inventory if the Bottle Club releases are not available. Please note that some of the beers will also be available to the general public, but as a Bottle Club member you are guaranteed one bottle of each of the included beers without fear of them selling out. The cost of membership is $36 on a bi-monthly basis and will be automatically charged on the 1st of the month. Termination of membership must be received in writing 30 days prior to the next scheduled pick-up. Kilowatt reserves the right to update this agreement at any time.